- The Golden Retriever - is a type of gun dog that was originated in the Scottish Highlands in the late 1800's to help in hunting, created by Lord Tweedmouth in Scotland. This is the most popular breed for families, "Goldies" are affable and obedient dogs. These dogs are very active, energetic and adapt to many different living situations requiring daily exercise. This kind of dog breed is often seen as guide dogs, used by police and military forces and also used for the search and rescue services, loyal and energetic, "Goldies" are able to get along with just about anyone. The golden colored coat is the hallmark of the "Goldies" which range from dark gold to light gold, they have a beautiful look with there striking golden color and there friendly personality. "Goldies" are one of the most beloved dogs for families everywhere. It is really not surprising as these faithful friends are sweet and obedient. To top it off they are very smart and very attractive animals. If you’re ready to get a "Goldie" you’ve made a great choice. Even so, there are some things you need to think about before you make the leap.The first thing to realize is that owning a dog is not easy. These animals want to please you, but that doesn’t mean they come without their trials. You need to be 100% sure that you and your family are ready for a dog. You can’t just put it in the backyard and expect to be a good dog owner.Golden Retrievers are known for their social personalities. They will want to be an integral part of your family. If you leave them outside you might be in for a surprise when they get into trouble. Goldens might dig holes and chew on your favorite outdoor furniture.Another thing to realize is that Goldens are large dogs. Be ready for loud barks! Even though they are very gentle, Golden Retrievers are a lot louder than a smaller dog would be. In addition to their sound, these dogs require a fairly large area to move around in. Beyond that, these dogs require a lot of attention. As was already mentioned, they are extremely social and need a lot of care. You can expect to brush their coat twice a week in addition to spending a lot of time with them.Your Golden Retriever will also need substantial amounts of exercise. You’d better have a lot of time to devote to their athleticism. Daily walks are a good idea for this breed. If they are not getting enough attention and exercise you are likely to see an increase in bad behavior.Sadly, Golden Retrievers are also known for getting health problems. Two of the most common are hip dysphasia and skin disorders. Be on the lookout for certain skin problems caused by fleabites and allergies. They might scratch these areas into what are called hot spots. Thankfully, there are some dog foods you can purchase to get rid of itching. Make sure their food doesn’t have wheat or corn as an ingredient. These are things that Goldens are often allergic to. Try and find things with meat protein, as they are a surefire way to make sure your dog is healthy.When you go to the breeder to choose a Golden you should stay away from ones that are too hyper. These are sometimes poorly bred. If you find a good breeder, they will not be breeding for money, but for the love of the dogs. In addition to breeders you can rescue a dog at a Golden Retriever rescue. You’ll find many dogs that are eager to please you and love to learn. These things aren’t said to scare you away from buying a "Goldie". Instead, they are said to enlighten you to the fact that owning this type of dog is not incredibly easy and without its downfalls. Even so, you couldn’t ask for a better pet or more faithful friend. 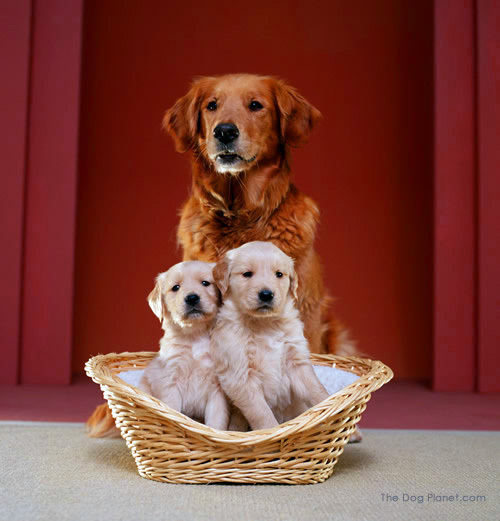 - Click here to know even more about the Golden Retriever Dog Breed. Copyright © 2011-2014 The-Dog-Planet.com. All rights reserved. Protected by Copyscape Plagiarism Checker - Do not copy content from this page.